Not so long ago, OS X's Finder was a revelation, providing a new, exciting way to access documents on a computer. 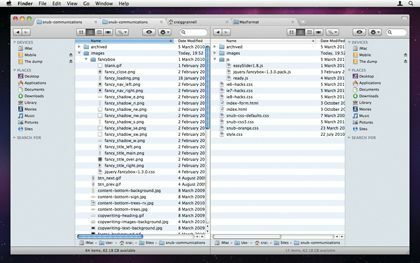 But that was many years ago and now Finder often looks tired compared to other navigation systems, especially if you're a power user. There have been efforts to replace Finder (notably Path Finder), but TotalFinder instead aims to build on top of Apple's file browser with useful new features. Tabbed and dual-pane browsing are the highlights. The former uses Google Chrome-style tabs that enable you to open multiple tabs in a single Finder window. Tabs can be dragged between windows or turned into new windows, and dragging files between tabs works nicely. The dual-pane mode also works surprisingly well, effectively welding two Finder windows together; the end result is perhaps visually cluttered, but we don't see how BinaryAge could improve things without losing functionality, and the mode enables efficient file management. TotalFinder also provides a system wide Finder window called Visor, which appears from the foot of the screen when activated, and settings to place folders above files and show invisible system files. The trade-off for all these features currently appears to be speed (Finder was less snappy, though still usable, on our test machines when TotalFinder was running) and aesthetics; TotalFinder's Chrome stylings are okay, but there were regular visual bugs throughout testing, such as background windows being displayed in foreground style.